Why convert only 30 percent of potential renters? Learn how to identify and plug the holes in your sales pipeline, use technology to track and convert leads, use proper follow-up techniques and more. Too many self-storage operators are content to convert only 30 percent of potential customers to renters, believing it's good enough to meet the "national average." But why should you watch 70 percent of your business walk out the door and rent from a competitor? Too often, we spend time and money trying to find new sources of business rather than convert our existing leads into customers. That's more expensive! 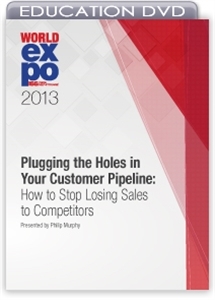 In this session, you'll learn how to identify and plug the holes in your sales pipeline. Our presenter will talk about technology that will help you track and convert leads, proper follow-up techniques and more. DVD - Improving Your Self-Storage Collections: Effective Skills to Get the Rent!